In a midwinter afternoon in 1928, an Indian dressed eloquently in long overcoat, and a formal British attire of the times, walked towards the Lahore railway station. He was wearing expensive clothes, well groomed and wore a mustache as the only facial hair. The mustache was turned up on the ends showing his pride, the head was adorned by a suede hat turned on a side in style. He was closely followed by a lady carrying a small child. The lady was dressed as someone from rich Indian class. Three poor looking servants were carrying their luggage and following them. On their way from the horse cart to train station, they were stopped by the few British officers. Police asked for their identity cards, upon checking and satisfied, they let them go. One of their servants fell behind while carrying a heavy load. He was stopped by the officers. When the Sahib realized one of his servants was stopped, he turned around and kicked his servant. Follow us closely, he told him in anger. Officers were shocked at the sudden reaction by the Sahib, happy the way he was treating the poor servant, smiled at him and let the servant go. Indian Sahib asked the officers why the security is so tight on the railway station. Officers replied that they are looking for a young Sikh guy who had murdered J. P. Saunders, a Deputy Superintendent of Police few days back. The sahib bid them good luck and walked towards the train going out of Lahore smiling and amused. Earlier in 1928, the British government created a commission under Sir John Simon to report on the current political situation in India. The Simon Commission was boycotted by all Indian political parties because it did not include a single Indian as its member and it was met with protests all over the country. The commission arrived in Lahore on October 30, 1928, Lala Lajpat Rai led the non-violent march as a protest against the commission. But the police responded with violence and the police Superintended Scott beat Lala Lajpat Rai severely while the rest of the police force tried to keep the remaining protestors at bay. Lala Lajpat Rai later succumbed to his injuries. Among the people who were kept away from Lala ji was Bhagat Singh, a mere young man of 21 years of age. 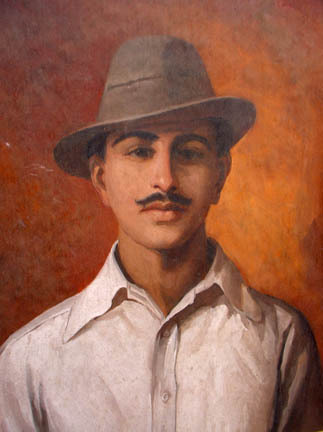 Bhagat Singh was born to a family of freedom fighters in 1907. In his teen years he read ferociously about the European revolutions and developed communist viewpoint. During that time he believed strongly in Gandhi’s Non-Cooperation Movement. In 1922, at Chauri Chaura, few British officers attacked few members of demonstrators of for the Gandhian movement. In retaliation, the remaining party members attacked the police chowki (police station) and set it ablaze. When Gandhi heard of the incident, he called off the movement. Bhagat was about 14 years of age then, and he was disappointed when the movement was called off. He felt strongly that one should have right to defend one self. He had escaped his home to avoid an early marriage and later joined National College at Lahore where he excelled in studies and dramatics. When questioned later why he ran away from home, he told him mother that he is already married. She was shocked, and relieved when he said he is married to freedom and will one day bring home his bride. During his years at National College, he became a member of Naujawan Bharat Sabha (Youth Society of India). He became popular and joined the Hindustan Republican Association who was bringing awareness among youth to fight for their freedom. He started writing for freedom newspapers in Urdu and Punjabi. He later organized a meeting of all the revolutionaries from all over India which was held under the name Kirti Kissan Party (Working Farmers Meet). He met and got highly influenced by Lala Lajpat Rai. Bhagat was one of the eyewitnesses of Lala ji being beaten by Police Superintended Scott during the Simon Commission protest. They were shouting slogans “Simon Commission Waapis Jayo” (Simon Commission Go Back) with their banners saying the same in 4 different languages. Three weeks later, Lala ji died from the head injuries he received. Bhagat was highly moved by this incident and decided to avenge his death. Bhagat joined other revolutionaries – Shivaram Rajguru, Jai Gopal and Sukhdev Thapar in a plot to kill the police chief. They watched the movements of Scott for days. The plan was that Jai Gopal who was posing as a street side vendor, would signal when Scott comes out of the police station in Lahore and Bhagat was supposed to shoot. Sukhdev and Rajguru were supposed to cover him and shoot Scott when required. On the day of the planning, a British Police officer in a large hat came out of the police station and Jai signaled his fellows. Bhagat fired a shot and pistol rang out in the heart of Lahore. Some guards outside the police station ran in to get guns. In the mean time Sukhdev and Rajguru joined Bhagat and the three emptied their pistols in the officer lying dead on the ground. It was then that they realized that the officer was not Superintendent Scott, but it was his deputy – J.P. Saunders. The three looked around to see if Scott would come out, but they saw guards coming out of the station with guns. The three ran in different directions. Guards got confused whom to follow. and they split after them. The confusion of the police and gave them few extra minutes to escape. He obtained some clothes that looked like upper class Indian clothes and a hat. The wife of his fellow revolutionary posed as his wife with a kid, the remaining three as their servants and they made their escape from the Lahore train station via train. The officers who checked their identities did not realize that the family of Sahib that just passed was in fact the very person they were looking for. The police searched more and found no traces of Bhagat Singh. He has excaped right under their noses. During the weeks that followed, British government enacted the Defence of India Act to give more power to the police. The Act was to combat revolutionaries like Bhagat Singh and was defeated in the council by one vote. However, the Act was then passed under the ordinance that claimed that it was in the best interest of the public. Bhagat Singh’s Hindustan Socialist Republican Association planned to explode a bomb in the assembly where the ordinance was going to be passed. The idea was to create noise and make people aware of this act so that they can protest against it. Chadrashekhar Azad attempted to stop Bhagat Singh from carrying out the bombings indicating that assembly would difficult to escape from. Bhagat response was why they would want to escape, when they can get more attention and awareness. Seeing all arguments fail with Bhagat and others have made up their mind too, Azad gave up. It was decided that Bhagat Singh and Batukeshwar Dutt would throw the bombs in the assembly and then distribute pamphlets which discuss the Act to bring awareness. April 8, 1929 is when Bhagat and Batukeshwar entered the assembly silently. And when the act was brought up, they stood up, and threw noise makers in the corridors of the assembly and shouted Inquilab Zindabad! (Long Live the Revolution!). They opened the front of their overcoats which revealed colorful leaflets talking about the Act and started showering and handing out the leaflets. They stood there and waited to be arrested, as they knew the escape would surely kill them due to the security outside the assembly. The bomb neither injured nor killed anyone, Singh and Dutt claimed that they used a noisemaker, a claim later confirmed by British forensics, that the bomb was not powerful enough to kill or injure anyone. Still they were sentenced to Transportation for Life for the bombing on June 12, 1929. The trial followed for the bombings and eventual involvement with Saunders killing was brought to light too. Bhagat Singh, Rajguru, and Sukhdev were charged with the murder. The rest of the members of their party were also captured one by one and they were all tried together. Bhagat Singh decided to use the court as a tool to publicize his cause for the independence of India and bring the awareness among the youth. They admitted to the murder and made statements against the British rule during the trial which were highly publicized in both British and Indian papers. Singh would quote past European revolutions and British Law and Policies. He would argue how they were wrong and how the British should learn from the history of their continent. Due to their anti-British arguments in the trial, the case was ordered to be carried out without the convicted being present at the hearing. This decision was met with an uproar among their followers as the public was now waiting to hear his views. 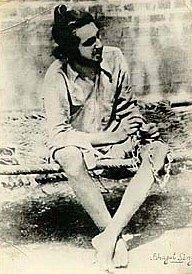 In jail, Bhagat and others led a hunger strike advocating for the rights of prisoners and undertrials. British jails at that time were treating murderers and thieves better than political prisoners, who, by law, were meant to be given better rights. The strike lasted more than two months and they eventually got better food for political prisoners, books and a daily newspaper. The British also agreed to provide better clothing, hygienic living conditions. He also demanded that political prisoners should not be treated to forced labor. British succumbed to their wishes which resulted in making Bhagat famous outside the prison walls beyond Punjab. His popularity grew in the subcontinent among the young Indians whom he had inspired. People started to ask to be treated better from their British masters. Being a ferocious reader from his young years, he devoured books in prison. He also kept a diary. He would read different books and note down quotations that he liked in his diary. He became friends with the jailor and other officers due to his good behavior. He befriended a homicide murderer who is said to have been influenced by him. He would sit down and have long talks with him. He turned from a heartless murderer to a person who was praying day and night to spare Bhagat’s life. The numerous supporters had been protesting against the hanging. Bhagat’s parents were struggling emotionally outside the jail. They had pride in their eyes from the revolution their son had started and also sadness from the upcoming loss. Bhagat had met his parents and sister earlier that day. His mother was last to see him. He asked forgiveness from his mother as he had not brought home the bride he had promised her. He also asked her not to cry when he is gone. “You are a brave mother who gave up his son to mother India for a bigger motive. You are an example of the big heart of an Indian mother who has given birth and blessed me. You might be loosing one son, but when you look up, you will see thousands more sons. And the mother of such brave sons can not be crying over the loss of just one”, he had told her. To avoid any violent protest by the supporters who had camped outside the prison for few days, it was decided to hang the three of them at 7 pm the night before they were due. The hanging which used to take place in the morning, was proponed by more than 12 hours. When the jailor came to fetch him, there were tears in his eyes when he told Bhagat “It is time.” Bhagat was reading Karl Marx’s book and he complained that if they had decided to hang him per schedule he would have finished the book. Sukhdev and Rajguru also joined, their hands tied behind their back. As they walked, their heads were held high in esteem, and they were all singing “Mera Rang De Bansanti Chola” (Dye my clothes saffron). This song has been passed on to generation and became a cult song in the hearts and minds of Indians. When they were about to be hanged, they refused to cover their heads. Their last wish was to untie their hands so that they can embrace one another. Police obliged and they were given their last freedom. They hugged and congratulated one another on having achieved the honor of dying for their motherland. Then they stepped forward and kissed the rope when they placed it around their necks themselves. There was smile on their faces and a hope for a free nation. They held each others hand and shouted “Inquilab Zindabad”. “Inquilab Zindabad” was heard from inside the jail at 7 pm on March 23, 1931. The shouts sounded happy and joyful. This was the signal of the final curtain dropping. The deathly silence that followed both inside and outside the prison was broken by his sister’s wails. Bhagat’s mother and father did not cry. They held their heads high with pride to have given their son in a struggle to free their motherland. The bodies were smuggled out of the jail by the police who feared that the dead bodies will instigate violence protests. The bodies were cremated by the police (some say cut and then cremated) at Hussainiwala on banks of Sutlej River. Bhagat Singh’s death had the effect that he desired and he inspired thousands of youths to assist the remainder of the Indian independence movement. After his hanging, youths in regions around Northern India rioted in protest against the British Raj. The Raj made Bhagat a martyr and wrote his name in golden letters in India’s independence struggle. On the banks of Sutlej River where he was cremated, the Bhagat Singh Memorial commemorates freedom fighters of India. A ceremony is held every year there to commemorate that day. But the ceremony is celebration of youth – inspiring the new generations. There are dramatics contests, debates, singing competition, something Bhagat Singh would have enjoyed.